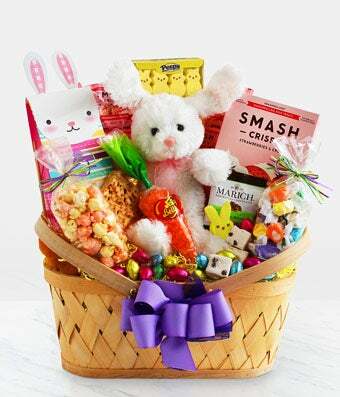 Easter wishes for everyone when you send this fun and adorable Easter basket full of all your favorites. The soft and cuddly bunny is surrounded by Easter treats for the whole gang. Milk chocolate Easter eggs from Jelly Belly, Lindt chocolate truffles, Too Good tea cookies and chocolate cookies, and a Ghirardelli® chocolate bar.